The name is of Saxon origin ‘Bola‘. Prior to the Norman invasion the estate was owned by a Saxon noble called Leofnoth, but by the time of the Domesday Survey records show the owner of the manor of Boulton to be Ralph FitzHerbert of Crich. The estate was never large and its boundary with Alvaston poorly defined. Ecclesiastically it was combined with Alvaston within the parish of Saint Peter’s, Derby. The FitzHerbert’s tenanted out their Boulton lands to the Colle family; the heiress of this family married into the Sacheverell family, who thus acquired in the 1180′s the estate. The church of Saint Mary’s was under the parish of Saint Peter’s in Derby but under the patronage for its living of the Abbots of Darley. The church was probably built by the Sacheverell’s, both the south doorway is Norman circa late twelfth-century; much of the original church was destroyed in 1840 when Mr John Mason of Derby enlarged it to accommodate a growing population. From its earliest beginnings it has been dedicated to the Blessed Virgin Mary. Further extensions to the church were made in 1871, 1887 and during the Edwardian period in 1907. 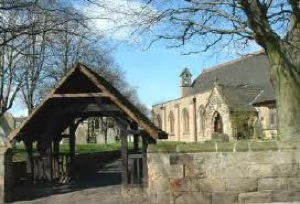 In 1730 Saint Mary’s, Boulton became a separate parish from Saint Peter’s in Derby (link to St Mary’s website); including within its boundaries Saint Michael and All Angels in Alvaston village. The latter was granted full parochial status in 1865.